By Annie Thornton; reposted with permission of Houzz. 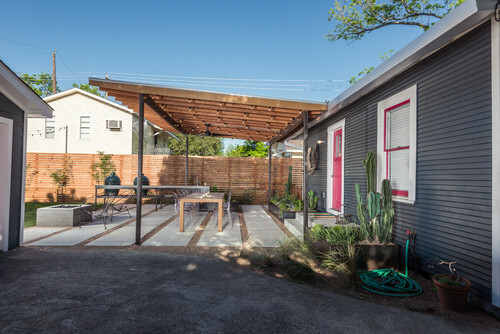 This modern patio adds 650 square feet of living space to a Houston couple’s 1,300 square foot house. Activities like dining and lounging now can happen outside, with backyard grilling and a fire pit just steps off the back door. Designer Brett Zamore chose a cohesive, simple material palette that reflects the homeowners’ request for an earthy feel, and shades and protects them from the Texas heat. “There is life to the space that was never there in the past. It has given the homeowners a new space for living, which is now outside,” says Zamore. Why: To create more living space for a couple in their late 20s living in a 1,300 square foot bungalow built in 1927. It was important for the space to be shaded and to allow airflow that would promote an overall feeling of lightness. Threshold: Zamore gave the existing back door a new set of concrete stairs. He matched the width of the stair treads to the width of the concrete pavers to create a consistent rhythm. Along the foundation, steel planters framed the staircase. Patio floor: Crushed granite gravel and Black Star gravel alternate between concrete pavers. The concrete pavers are 3 feet wide and 25 feet long with a 6 inch space between them. Zamore removed 4 inches of dirt, packed down the ground and installed a weed barrier as a base. On top of that, he installed a 2 inch layer of small, crushed concrete or limestone and then a 2 inch layer of gravel on top of that. Patio cover: Cedar roof with standing seam steel (Galvalume) cover. Wood roof is 2-by-6 rafters at 16 inches on center and 1-by-4 wood cedar screens, with the Galvalume attached to it. Pergola dimensions: 19 feet wide and 15 feet deep; 10 feet, 6 inches tall at the highest point, and then slopes at a 1:12 grade back toward the house. Attached or detached: The roof angles down toward the house and connects to the house with a rain gutter, but the pergola’s structure is independent of the house. The rain gutter drains water from both of the roofs into crushed gravel in the side yard. The pergola extends 8 inches past the side of the house on one side so that the gutter can extend back and down to the drainage. 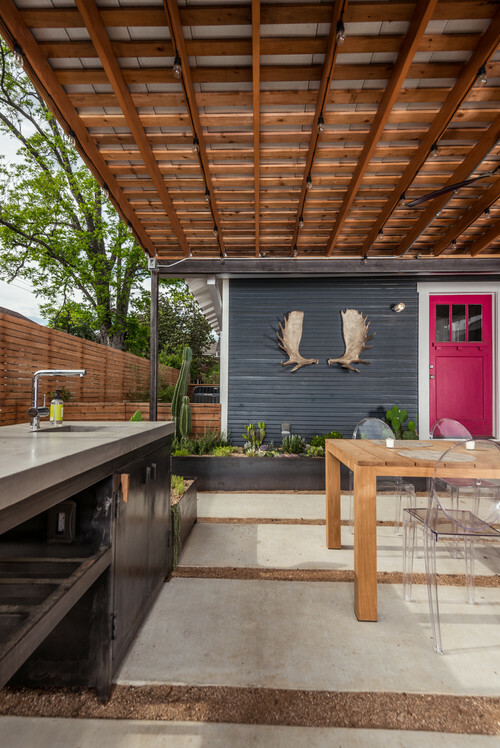 Outdoor kitchen: A concrete counter runs perpendicular to the house and tops the rough steel cabinets that were built onsite. The kitchen includes a sink, cabinets and two Big Green Egg grills. The interior edge of countertop lines up with the exterior face of the house, framing and opening up the outdoor living space. Planters: Steel planters filled with cactuses and succulents soften the foundation and match the depth of the back stairs to create a seamless threshold to the patio. They also align with the posts of the pergola. String lights and ceiling fan: They are each wired separately and are wired back to the house. 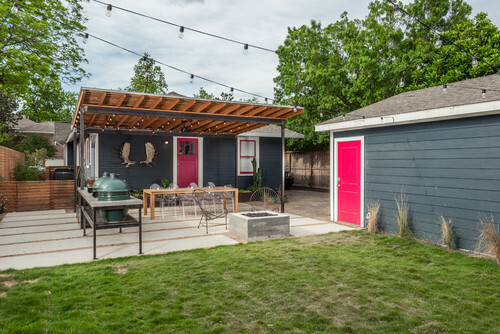 Fire pit: The concrete fire pit is aligned with the end of the kitchen countertop and is centered between the counter and the garage. It helps with the transition from patio to grass.